Aquablast provides innovative and environmentally-friendly surface preparation contracting services at a number of Mediterranean locations. The full service contracting division, based in Constanza, Romania, offers blasting and painting services for any size of ship repair or industrial project. Aquablast's squad of Romanian blaster/painters are experienced with all modern methods of surface preparation, especially with UHP water blasting to 3,800 bar (55,000 psi); high pressure water jetting to 1200 bar (17,000 psi). The Aquablaster pressurised wet abrasive system and "Superstripper" wet abrasive with UHP boost. A wide range of conventional and dust-free equipment is available. 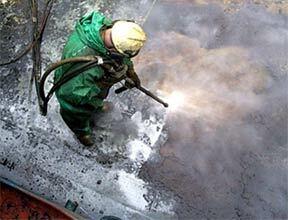 Romanian blasting crews are available worldwide from the Constanza office for any type of surface preparation project. "Hands-on" training on live projects in Constanza by experienced managers ensures these crews are fully experienced and familiar with international quality and safety standards before they undertake their first overseas assignments. For consultation on any surface preparation project Contact Aquablast directly in United Kingdom.